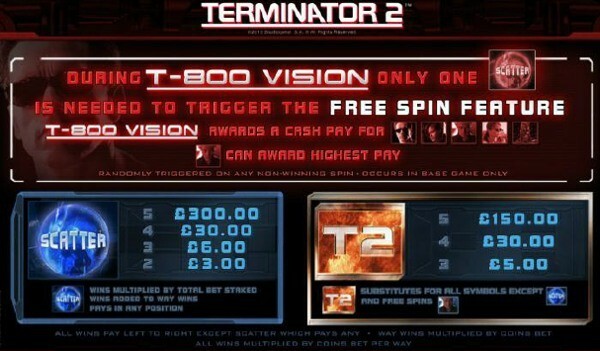 Travel back in time with Microgaming's action-packed new video slot - Terminator 2™. Relive the glory of the Academy-Award winning film with thrilling movie clips, an electrifying soundtrack, and exclusive bonus features. It was the blockbuster movie of the 1990s and now it's a blockbuster online slot machine game. 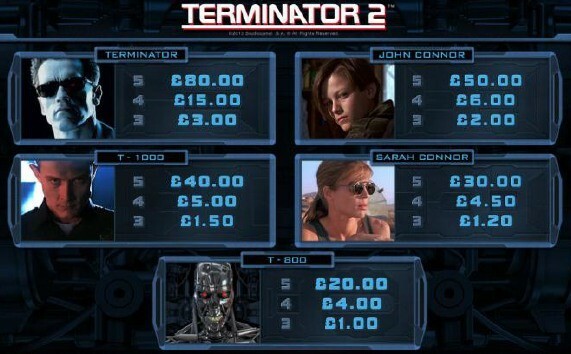 Terminator 2 has action and adventure, great special effects, and 243 ways to win real jackpots. The Base Game features star-studded Reels with 5 of a kind videos featuring everyone's favourite clips from the iconic film. During the Base Game, the volatile T-800 Vision feature can trigger at random, washing the screen with an eerie red glow and awarding mystery prizes for all High Symbols on the Reels. T2 logo is a wild symbol that can substitute for other symbols to create big wins. The Orb - the Terminator's means of transport across time - acts as a scatter symbol. 2 or more Orbs scattered anywhere on the reels will give you a payout. And 3 or more Orbs will also trigger 10 free spins. The graphical elements of the game really come into their own in the bonus features. On entry into the T-800 Vision feature, the player gets to experience the game through the eyes of the Terminator as he scans for his targets. Each element of the character has been carefully recreated for optimum realism, with statistics, measurements and tactical information flickering in the viewfinder. The feature triggers at random on any NON-WINNING spin. The T-1000 symbol awards the highest cash prize, therefore, the T-1000 symbol is scanned last in the scanning process, and has a uniquely different animation associated to it when scanned. While in this futuristic feature, a single Scatter will trigger Free Spins. Blackjack Ballroom - $/€500 and 1 Hour Free OR 40% Match on first deposit up to $/€400. Buster Hammer - Bonus Feature 243 Ways to Win game from NextGen Gaming. Night Jasmine - Bonus Feature 243 Ways to Win game from Bally. 7 Sins - Free Spins 243 Ways to Win game from Play n Go. Baywatch - New Bonus Feature 20 Line Slot Machine. Top Trumps Celebs - Bonus Feature 20 Line Slot Machine. Rocky Slot - Bonus Feature 25 Line Slot Machine.